In the pre-WSR-88D era, many radar consoles allowed operational meteorologists to manually control the radar beam, including the capabilities to view vertical cross-sections. These radar display and control capabilities allowed research and operational meteorologists to amass expertise in the horizontal and vertical structure and evolution of severe storms, and allowed for the development of the first operational guidelines for diagnosing base radar data in identifying supercell storms ( aka the “Lemon Technique”). The WSR-88D operates using automated volume coverage patterns, and display techniques to convert elevation scan data into vertical cross-sections is not very user friendly. 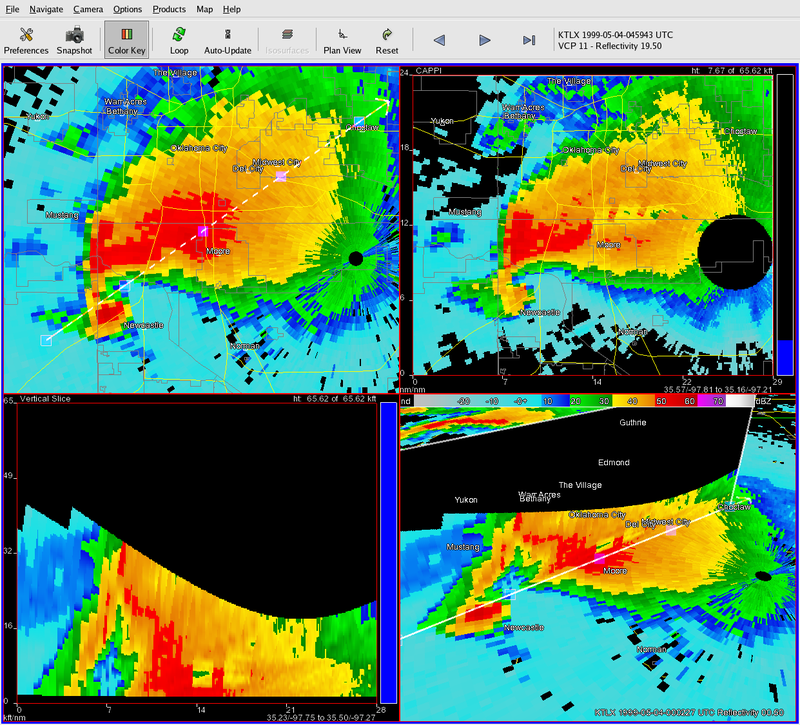 The National Severe Storms Laboratory (NSSL) developed a 3D and 4D base radar display application for its Warning Decision Support System – Integrated Information (WDSSII). This technology allows users to create and manipulate dynamic cross-sections (both vertical and at constant altitude), such that one can “slice and dice” storms and view these data in three-dimensions and across time. This project has been imported into AWIPS. Improved vertical cross-sections: Dynamic placement and re-position of a cross-section reference line showing real-time updates to the cross-section data. Cross-sections are no longer a one-time requested RPG product, and are instead generated on-the-fly using 8-bit data. Constant Altitude cross-sections (CAPPIs): 8-bit radar data plotted at constant altitude eliminates the need to sample elevation scan data for altitude or reset elevation angle choices in four-panel displays. Cross-section control is also dynamic, showing real-time updates to the cross-section data. 3D visualization: 8-bit radar data from elevation scans, vertical cross-sections, and CAPPIs are plotted as 2D textures in 3D space. A forecaster can then zoom, pan, pitch, yaw, and fly about the data in 3D. Virtual Volumes: No volume scan is incomplete. As new elevation scans are updated, they replace the old elevation scans in the virtual volume one-by-one. This means that there are full volumes of data available at all times for cross-sections and data perusal. Access to entire data inventory: An “All-Tilts” product only allows the forecaster to peruse a sequential order of elevation scan frames. For a 32 (64) frame limit in VCP12, that only comprises 2 ½ (5) volume scans. The FSI allows the user to access any elevation scan in the radar data inventory RPS list, up to 1 or 2 hours of 8-bit data for all elevation scans. Linked four-panel design, with a constant elevation angle panel, a CAPPI panel, a Vertical Cross-section panel, and a panel displaying the data in three-dimensions. D2D All-Tilts “look and feel” radar volume browsing controls. Animation (looping) controls for the added 4 th dimension. Keyboard shortcuts (“hotkeys”) for selection of elevation angles, volume scan times, radar products, and other navigation short-cuts (e.g., reset to zenith view). Rapid loading of image frames (either on the fly, or via pre-loading), and rapid panning, zooming, pitch and yaw of 3D data. Dynamic cross section capabilities (vertical and horizontal). Users can manipulate the location of a cross section reference line using mouse controls, and cross-section textures will dynamically update on-the-fly in the other panels. The above .avi may require installation of this Microsoft video codec. NWS Operational Services Improvement Plan (OSIP) Statement of Need (SON), Project Plan (PP), and Concept of Operations (ConOps). Who is developing the FSI? Page last Modified: November 13, 2009.